We have a wide selection of books; both fiction and non-fiction in our libraries and all children are encouraged to take books home each night .In KS1/EYFS the children follow a ‘banded system’ that ensures that children read books matched to their reading ability. The KS2 library has a computerised system for issuing and tracking the borrowing of books. The computerised system allows us to track the range of books they have read and the class teacher keeps weekly guided reading records in schools. Children’s progress in reading is regularly assessed and tracked against the national curriculum. Many of our parents come into school to share reading with children. Children are encouraged to read a range of reading matter using different books, plays, poems as well as electronic texts. English teaching is carefully balanced so that the children read, analyze and interpret different text types throughout the school. The children follow the Letters and Sounds scheme which aims to accelerate the progress of early reading. Every day the children receive a 20 minute rapid-paced phonics lesson which is delivered by a teacher or trained teaching assistant. These lessons follow the revise, teach, practice and apply structure using a range of multi-sensory resources. Children are assessed against their sound/symbol correspondence as well as their ability to segment and blend phonemes. In Year One the children undertake the National Phonics Screen. The National phonics Screen is an important diagnostic check that enables teachers to identify which children can use and apply their phonic skills. The results are shared with parents in the end of year reports and they are used diagnostically to highlight phonic misconceptions and thus accelerate the progress of reading. If a child fails the Year One Phonic Check they are allowed to retake it at the end of Year Two. At The Weald we follow the National Curriculum guidance on Grammar, Punctuation and Spelling and incorporate the teaching and learning of these areas into our writing lessons and cross curricular links to learning. This is sometimes taught as part of a creative writing session (in a context for writing eg a story, an information text) or is taught discretely when children are learning a new skill or gaining new knowledge. Children are also involved in daily opportunities to revise, learn and practise their spelling knowledge in context through our use of the "No Nonsense approach to Spelling". In Years 2 and 3 there is often transition from our use of Phonics approach: " Letters and Sounds" with the transition to "No Nonsense Spelling" within ability groups to allow for both support and challenge at the transition point from Key Stage 1 to Key Stage 2 and to secure the highest standards possible. 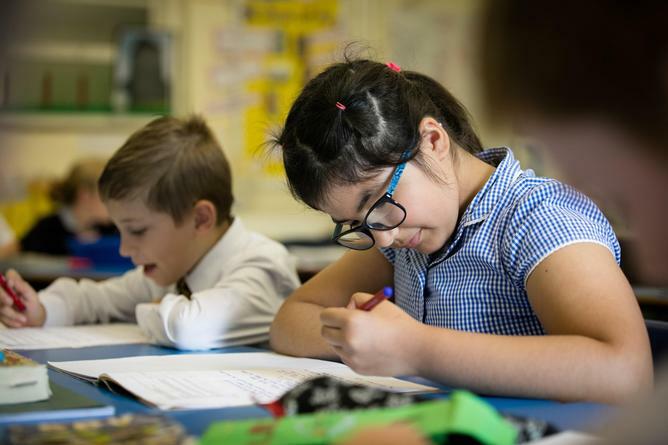 Children are encouraged to edit their writing for Grammar, Punctuation and Spelling errors through feedback and marking from the teaching staff and teaching assistants and enjoy challenging one another to be the best that they can be. In EYFS, our youngest children use writing in both structured play situations and in more formal adult directed lessons to record their ideas. Throughout KS1 and KS2 children learn the craft of writing by engaging in shared and guided writing sessions. All staff have been trained in the writing approaches advocated by Jane Consodine’s Write Stuff INSET. This means that during a unit of work children are provided with different opportunities to develop their writing skills both collaboratively and independently. Throughout a unit of work children build up to producing a sustained independent piece of writing. Daily our children are taught the rules of spelling and grammar and are expected to apply these concepts into their writing. They are set targets to improve their writing each term and grouped in their classes to help them achieve these targets; they share the targets with parents each term at parent’s evenings. The school has adopted ‘The Letter join Handwriting scheme of work’. Children are encouraged to write cursively from an early age and to practice the correct formations including the ‘get ready strokes’. By Year Two we expect most children to be writing with a legible cursive style where the letters are of a regular size. Throughout KS2 children should be use a blue handwriting pen.